With an act titled "Salt-N-Pepa," one might assume that this is a duo. However, anyone who's looked into the so-called duo will realize that it is actually a trio that features Spinderella as the mix-mastering DJ. Some guys like Salt. Some guys like Pepa. But I prefer Spinderella - the band's unsung hero, literally. 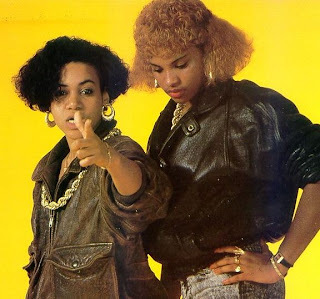 In all honesty, I do not know that much about Salt-N-Pepa, except for my attraction to Spinderella. I also have heard the band's songs titled "Shoop," "Whatta Man" and "Push It." I am uncertain of the intentions behind "Push It," but considering the song was released in 1987, I suspect it is a commentary on how the Cold War became unnecessarily intense between the USSR and U.S. By singing "Push It" and then gyrating, Salt-N-Pepa were pointing out how ridiculous a nuclear holocaust would be if Reagan or Gorbachev pushed that dreaded red button in their bedrooms.